Frari Architecture Network in Aveiro, Portugal, brings to us today a beautiful wood and concrete creation to explore. The Deck House was created by overhauling an existing single family home that was five years old, and turning it into a extended villa with much better use of the available space. The spacial organisation of the original structure was very poor, as it lacked space in certain areas, while wasting space in others. This meant that the architects had a great challenge ahead of them, and they certainly rose to the occasion! As you'll see when you join us for a tour of the house in just a minute, the spaces of the interior are impressive and the materials serve to astound. As a whole, the structure is functional, but also unmatched in its aesthetic. What you'll find in this home is an integration of nature on every level, as well as modernity beyond imagination. Sound exciting? Let's get going then! From this point of view, the Deck House seems to stretch into eternity! The dimensions of the home seems boundless, and this is a true testament to the skilled work of the team involved with the project—making limited space seem full of possibility. Here we can also so a lovely, clear swimming pool for the warmer days, surrounded by a fresh lawn and a multitude of other plants to beautify the ecological space. This luxury was unavailable in the original home's design. For this project, the architects had the job of combining two lots, including the lot on which the original structure was situated. This allowed for a horizontal volume stretching across the spaces, and more area available for a garden or lawn. The combined area or the newly unified property is 1300 square metres. From the street we see the house in a new light. On this side, there is much more plaster at the forefront, while the wooden panels are still present, but moving more to the realm of decorative element. The vivid white painted plaster contrasts strongly with the wooden material, but the effect is not completely dividing. What it does is allow a dynamic visual presence to take root whilst not being too dramatic. With the renewal of the original structure came the challenge of integrating the new with the old. 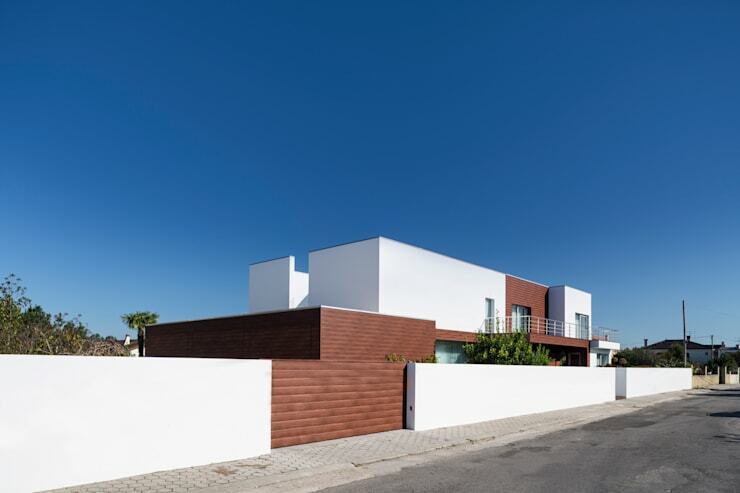 For this reason, the façade consists of these composite panels—the white plaster and the wooden areas. So, in addition to creating the interesting visual dynamic, this façade design also serves a functional purpose. The interiors of the home are similarly white as the plastered parts of the façade. 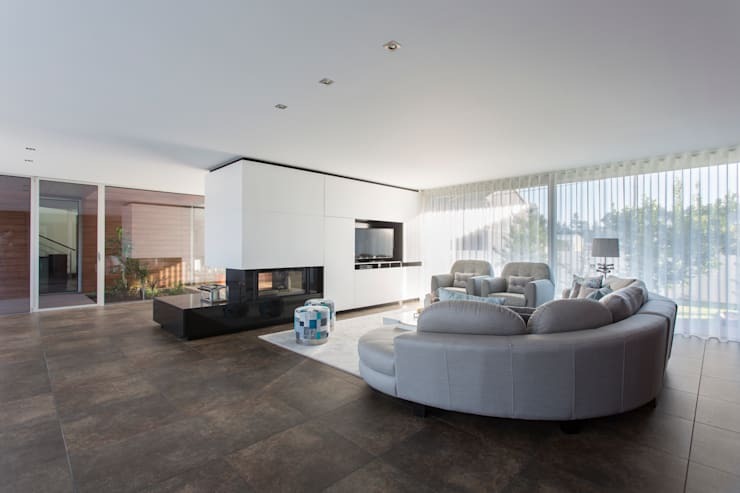 This expands the interior spaces, and also creates a coherent whole with the outside of the home. In addition to this, the use of soft, translucent fabric for the curtains lining the extended glass walls provide a gentle atmosphere to the entire area. The furniture in this living room area is modern and minimal. The off-white circular sofa and comfortable recliners are more than enough to provide relaxed seating and socialisation in the spice. There is also a fire place for the colder days of the year, and with the neutral surroundings, a fire must create a warm and calming atmosphere in the room. 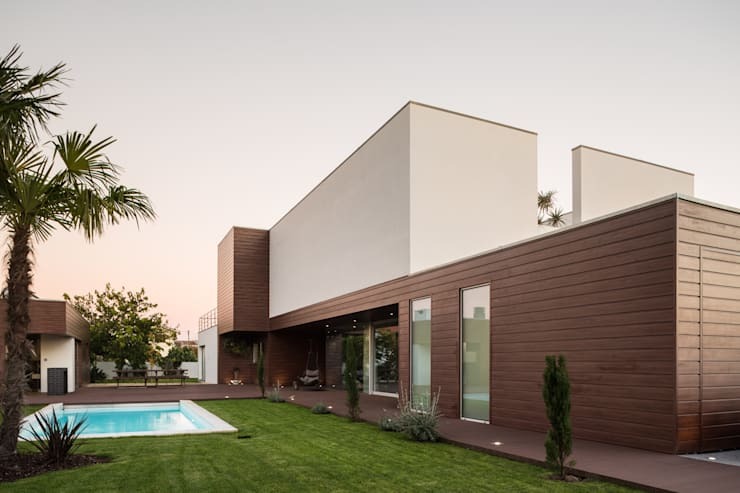 The entrance of the house yields a continuation and extension of the wooden panels we have seen in the home's façade. This lovely wooden enclosure provides a warm and natural entrance to the home which is inviting to all and must make guests feel at ease. We also find a charming little garden as welcoming gift to the eyes. The home's original design had no green area to speak of, not even a back yard or garden. For this reason, the architects made it their priority to include natural elements and green spaces in the new design. In addition to the back yard lawn around the pool, this inserted garden bed at the entrance of the home contributes to this ethic. The aim was really to establish a relationship between the indoor and outdoor spaces, and this area is just one of the ways the desired outcome was achieved. Now, let's move into the more intimate spaces of the house. Here we can find the master bedroom and inside it, ultra modern and ultra-interesting bathtub design. 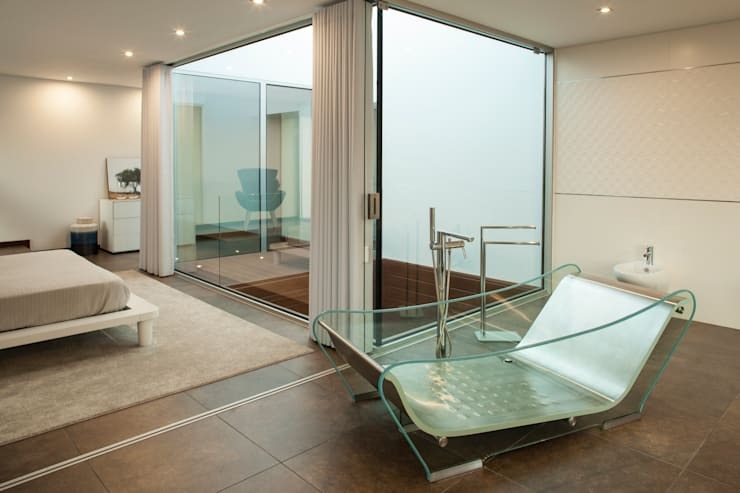 This beautifully crafted and innovative free-standing feature consists of an aluminium base, formed like a daybed, and bordered on both sides by clear Perspex. This certainly seems like what is meant by in the lap of luxury ! The bathtub is complimented by stainless steel features throughout the bathroom to keep to the modern aesthetic. If you are looking for more inspirational ideas, take a look at: Cool Design Trends For Modern Bathrooms. This bathroom forms part of the master bedroom, which is bordered by glass on all sides, providing full sunlight from the south while also allowing uninterrupted views of the garden. Outside of the home, the ethic of luxury is continued. 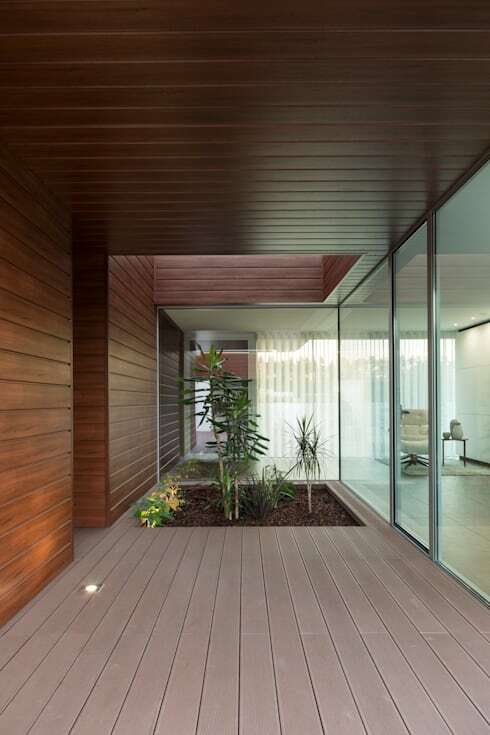 Here we find a wooden deck in the same style as the wood panels used in the home's façade. The area is enclosed by the plastered white walls, and the entire space is situated on the top level of the home, just outside the master bedroom. 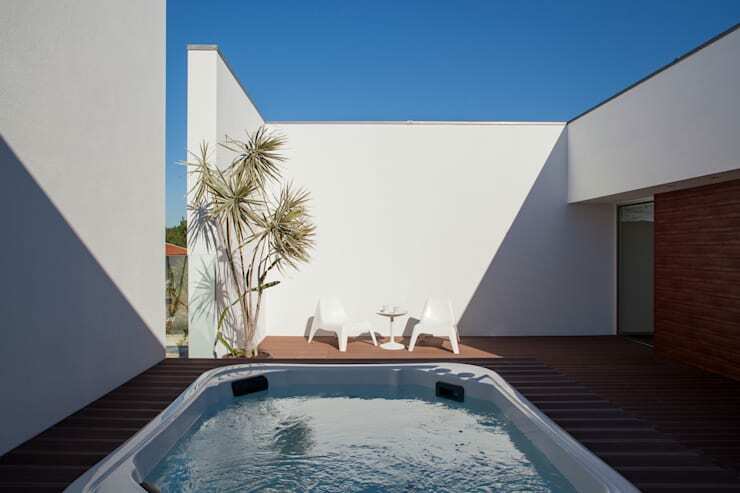 In the corner closest to our point of reference we can see a jacuzzi bubbling, perfect for lazing Sundays or unwinding after a tough day at work. It is accompanied by an outdoor furniture set, just big enough for the inhabitants of the master bedroom to enjoy a fresh breakfast in the morning. We also see a decorative tree in the corner, adding to the ethos of integrating the structure with nature. It seems like the architects have reached all of their goals. Did you find inspiration in the Deck House? Is there anything you'd change? We'd love to hear your thoughts!